Born September 26, 1911 at Sterling, Kansas, he attended Kansas State Teachers College for two years before entering the United States Naval Academy in 1931. He was commissioned a Second Lieutennt of Marines upon graduation on June 5, 1935. He completed the Basic School in 1935 and then served with the 1st Battalion at Quantico, Virginia. In October 1936, he joined the 2nd Marine Brigade at San Diego, California. Where there he was promoted to First Lieutenant in July 1938. That September he embarked for Guam where he served almost two years. He returned to Quantico in July 1940 and was subsequently assigned to the 4th and later the 5th Defense Battalion at Parris Island, South Carolina. He was promoted to Captain in March 1941. Upon the outbreak of World War II, he was ordered overseas, joining the 2nd Defense Battalion on American Samoa in January 1942. With the exception of a brief period in 1944 under instruction at the Army Field Artillery School at Fort Sill, Oklahoma, he remained in the Pacific throughout the war. While overseas, he was promoted to Major in May 1942 and to Lieutenant Colonel in May 1943. As commander of a 5-Inch Artillery Group, he moved to Tarawa in November 1943 in conjunction with the initial landings there, and commanded the group through repreated enemy bombing raids. He became battalion commander in May 1944. He joined the 2nd Marine Division on Saipan in October 1944. As commander of the 2nd Battalion, 10th Marines, he took part in combat in the landing on the seizure of Iheya Shima and in the final stages of the Okinawa campaign. For meritorious service on Tarawa and Okinawa, he was awarded the Bronze Star with Combat V.
He returned to the U.S. in July 1945 and the following month was assigned to the Bureau of Ordnance, U.S. Navy Department. He departed Washington in August 1947 for the Marine Corps Schools at Quantico, where he completed the Senior Course in June 1948, then served consecutively as Supervisory Instructor, Senior Course and Assistant Director of the Junior Course. He was promoted to Colonel in June 1950 and in May 1951 joined the 1st Marine Division in Korea where he served in combat as commander, 5th Marines. For outstanding service in this capacity during the period of August 5 to November 19, he was awarded the Legion of Merit with Combat V. Subsequently as Chief of Staff, 1st Marine Division (reinforced), he was awarded his second Legion of Merit for the period of Novembr 26, 1951 to February 10, 1952. His participation in liaison and reconnaissance flights from May 1951 to January 1952 also earned him two Air Medals. In March 1952 he returned to Marine Headquarters, serving through August 1952 as a member of the Fleet Marine Force Organizational Structure Board andof the U.S. Navy Examining Board. Enrolling at the Army War College, he completed the course in June 1953. In July of that year, he returned to the Marine Corps Schools to serve as a memberof the Advance Research Team. Reassigned to Marine Headquarters in July 1954, he served as Assistant G-1 and subsequently served on the Marine Corps Table of Organization Board until July 1956. He then transferred to Camp Pendleton, California, where he served as Chief of Staff, 1st Marine Division (reinforced), through May 1958. Following this, he was named Commanding General, Recruit Training Command, Marine Corps Recruit Depot, San Diego, California, and was promoted to Brigadier General in July 1958. He departed San Diego in November 1959 and later that month assumed command of the 1st Marine Brigade at Kaneohe Bay, Hawaii. He was promoted to Major General in August 1961. In February 1962 he relinquished command of the 1st Brigade and, that same month, assumed duty in Saigon as Chief of Staff of the newly-created U.S. Military Assistance Command, Vietnam. For exceptionally meritorious service in Vietnam until May 1964, during a period of continuing crisis, he was awarded the Distinguished Service Medal. Reporting to Marine Headquarters in June 1964, he served as Assistant Chief of Staff, G-3, until July 1965, when he was designated Director of Personnel. For outstanding performance in this role from July 19, 1965 to May 3, 1967, he was awarded the U.S. Navy Commendation Medal. Nominated for three-star rank by President Lyndon Johnson in May 1967, he was promoted to that rank, July 1, 1967, on assuming duty as Commanding General, Fleet Marine Force, Atlantic, and Commanding General II Marine Expeditionary Force. For this service until his retirement, he was awarded a Gold Star in lieu of a second Distinguished Service Medal. His medals include the Distinguished Service Medal with Gold Star; the Legion of Merit with Combat V and Gold Star; the Air Medal with Gold Star; the Navy Commendation Medal with Base Clasp; the Asiatic-Pacific Campaign Medal; World War II Victory Medal; National Defense Service Medal with 1 Bronze Star; the Korean Service Medal with 3 Bronze Stars; the Vietnam Service Medal with 1 Bronze Star; the U.N. Service Medal; Korean Presidential Unit Citation; Republic of Vietnam Campaign Medal. 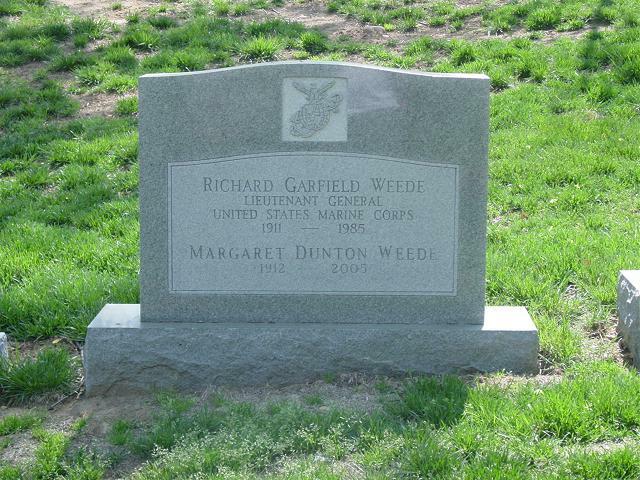 He and his wife, the former Margaret Dunton of Arcadia, Kansas, have a son, Major Richrd D. Weede, who was commissioned in the Marine Corps on graduation from the Virginia Military Institute (VMI). He died on October 22, 1985 at the Portsmouth, Virginia, Naval Hospital after a long bout with cancer. He was buried in Section 5 of Arlington National Cemetery.